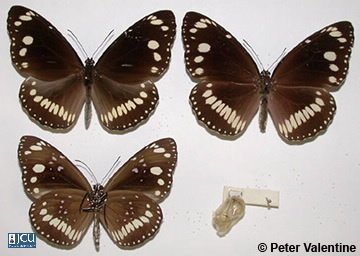 Larvae feed on native and introduced species in the Apocynaceae s.lat. (Apocynaceae + Asclepiadaceae) including the rubber vine, Cryptostegia grandiflora, as well as Ficus spp. Mature larvae 57 mm long, body orange or orange-brown with some black bands edged with a white transverse band. Adults dark brown with large cream spots towards the margins and small ones close to the margins. Lower surface paler, similar with some greyish-white spots in the central area.